Happy New Year! Sometimes, a gift arrives by email. I received one just before the new year: a link to Reading and Writing Tools for Academic English, a site designed by Eoin Jordan and Andy Snyder, instructors at Xi’an Jiaotong-Liverpool University. This ad-free site offers a suite of nifty tools, games, and practice for academic reading, writing, and vocabulary. Let’s start with vocabulary. A quiz with a simple interface asks you to select words for which you know at least one definition, and then reports your probable vocabulary size (measured by the number of “word families” you likely know (e.g. “identity, identify, identification” would belong to one word family)). The quiz includes nonsense words on every page, which is fun. At the end, the results page points out words words you did not recognize at each level of the first 9,000 most common word families in written English. (I’m not sure what corpora this determination of word frequencies is based on.) The test generates a random list each time, so you can repeat the test multiple times. One version of the quiz focuses exclusively on Averil Coxhead’s (2002) Academic Word List (AWL), which is a collection of 570 word families identified as much more common in a corpus of academic texts than in other types of writing such as popular journalism or fiction. When you explore the reading tools, the most interesting is Reading Mate. You copy in a text and get a markup of words that likely exceed your vocabulary knowledge (as measured by the first quiz), and an analysis of proper nouns, text readability, and more. While the highlighting doesn’t link to definitions or other example usage of highlighted words, it may reveal words that would be useful to look up (or that you see you can ignore and still get what you want from reading the text.) One objective of Reading Mate is to help you select texts that are at your independent reading level; this might be a helpful way to screen a novel or magazine you’d like to read for pleasure, for example (if you can find an excerpt electronically somewhere). 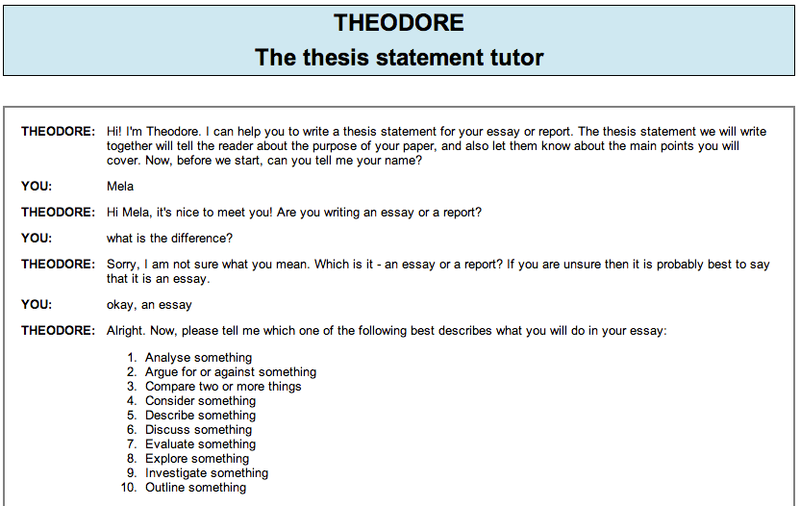 Under writing tools, I don’t recommend the Thesis Statement Tutor for graduate and advanced undergraduate student writers, since it seems to produce overly formulaic thesis statements. Nonetheless, you may find this a useful way to force yourself to think through your purpose and organization of a piece of writing. I do think that there are some ways in which the writing tool Marking Mate is useful. You input a text you’ve written and get feedback through an automated text analyzer. 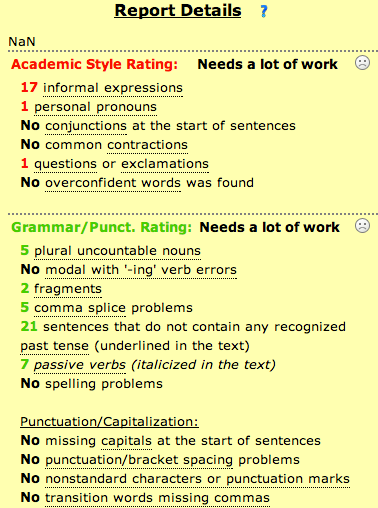 Then Report Details provides feedback on academic style and grammatical accuracy. You may be able to find some grammar issues this way, and may be able to identify ways in which a text might sound too informal. Rather than seeing this tool as a sure-fire way to proofread your writing, consider it instead a diagnostic tool that can identify some potential areas for ongoing language improvement. Quite a few instances of unclear wording in my sample text were not identified by this tool. 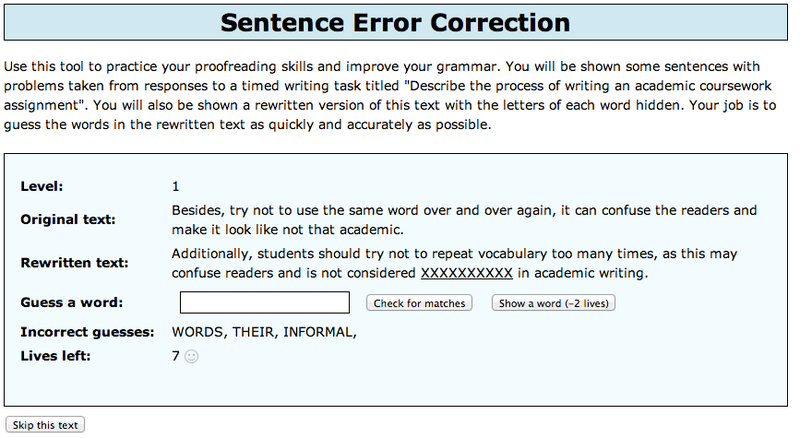 Nonetheless, the prevalence of informal expressions and the types of grammar errors found were spot-on. A nice bonus in Marking Mate is a set of links to advice on the topics identified for further work, and even some additional practice activities. Just click on underlined text in the Report Details. 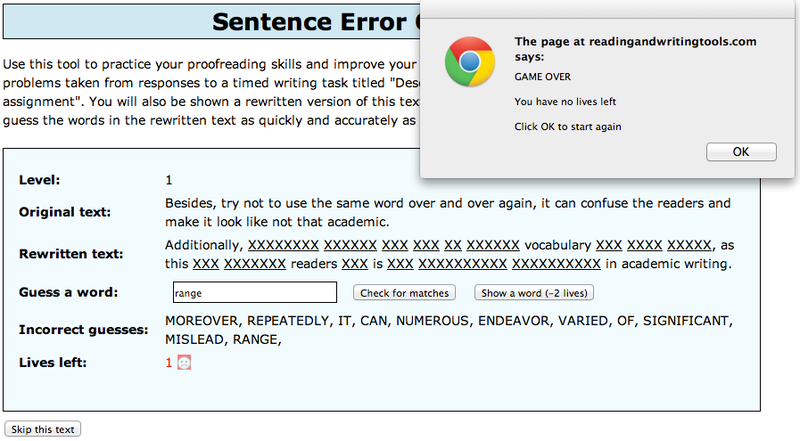 Finally, I really recommend the Sentence Error Correction Game. It’s hard! You’re given a context in which a sentence is (poorly) written. You’re given blanks that indicate a paraphrased, formal, accurate rewritten version of that sentence. Your job is to guess what words might be in those blanks. It’s easy to lose, but after losing, you get to try the same sentence again. It took me three tries to figure out the first one. I think that the greatest value in this activity is in cultivating the ability to paraphrase an idea in formal written English. Even if the paraphrase you try isn’t what the game is looking for, the act of trying will expand your fluency and access to your vocabulary. This site was a delight to discover. I hope that such gifts are sprinkled throughout your new year. Keep sending in your ideas for sites and apps that the University of Michigan English Language Institute can review here. Categories: Suggested Websites | Tags: academic, academic vocabulary, Academic writing, automated feedback, AWL, diagnostic, EAP, feedback, fluency, game, grammar, paraphrase, quiz, reading, register, vocabulary, writing, writing style | Permalink.